Engage your mind always in thinking of Me, offer obeisances and worship Me. Being completely absorbed in Me, surely you will come to Me. In this verse it is clearly indicated that Krishna consciousness is the only means of being delivered from the clutches of this contaminated material world. Sometimes unscrupulous commentators distort the meaning of what is clearly stated here: that all devotional service should be offered to the Supreme Personality of Godhead, Krishna. Unfortunately, unscrupulous commentators divert the mind of the reader to that which is not at all feasible. Such commentators do not know that there is no difference between Krishna's mind and Krishna. Krishna is not an ordinary human being; He is Absolute Truth. His body, mind and He Himself are one and absolute. It is stated in the Kurma Purana, as it is quoted by Bhaktisiddhanta Sarasvati Gosvami in his Anubhasya comments on the Caitanya-caritamrta (Fifth Chapter, Adi-lila, verses 41-48), "deha-dehi-vibhedo 'yam nesvare vidyate kvacit" This means that there is no difference in Krishna, the Supreme Lord, between Himself and His body. But, because they do not know this science of Krishna, the commentators hide Krishna and divide His personality from His mind or from His body. Although this is sheer ignorance of the science of Krishna, some men make profit out of misleading the people. There are some who are demonic; they also think of Krishna, but enviously, just like King Kamsa, Krishna's uncle. He was also thinking of Krishna always, but he thought of Krishna as his enemy. He was always in anxiety, wondering when Krishna would come to kill him. That kind of thinking will not help us. 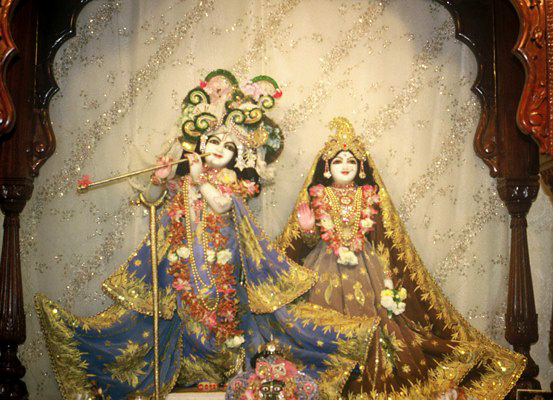 One should be thinking of Krishna in devotional love. That is bhakti. One should cultivate the knowledge of Krishna continually. What is that favorable cultivation? It is to learn from a bona fide teacher. Krishna is the Supreme Personality of Godhead, and we have several times explained that His body is not material, but is eternal, blissful knowledge. This kind of talk about Krishna will help one become a devotee. Otherwise, understanding Krishna from the wrong source will prove fruitless. One should therefore engage his mind in the eternal form, the primal form of Krishna; with conviction in his heart that Krishna is the Supreme, he should engage himself in worship. There are hundreds of thousands of temples in India for the worship of Krishna, and devotional service is practiced there. When such practice is made, one has to offer obeisances to Krishna. One should lower his head before the Deity and engage his mind, his body, his activities -- everything. That will make one fully absorbed in Krishna without deviation. This will help one transfer into the Krishnaloka. One should not be deviated by unscrupulous commentators. One must engage in the nine different processes of devotional service, beginning with hearing and chanting about Krishna. Pure devotional service is the highest achievement of human society. In the Seventh and Eighth chapters of Bhagavad-gita, pure devotional service to the Lord has been explained, apart from the yoga of knowledge and mystic yoga or fruitive activities. Those who are not purely sanctified may be attracted by different features of the Lord, like the impersonal brahmajyoti and localized Paramatma, but a pure devotee directly takes to the service of the Supreme Lord. There is a beautiful poem about Krishna in which it is clearly stated that any person who is engaged in the worship of demigods is most unintelligent and cannot achieve at any time the supreme award of Krishna. The devotee, in the beginning, may sometimes fall from the standard, but still he should be considered superior to all other philosophers and yogis. One who always engages in Krishna consciousness should be understood to be the perfect saintly person. His accidental nondevotional activities will diminish, and he will soon be situated without any doubt in complete perfection. The pure devotee has no actual chance to fall down because the Supreme Godhead personally takes care of His pure devotees. Therefore, the intelligent person should take directly to this process of Krishna consciousness and happily live in this material world. He will eventually receive the supreme award of Krishna.